↑ 1.0 1.1 Edenhofer, Ottmar; Wallacher, Johannes; Lotze-Campen, Hermann; Reder, Michael; Knopf, Brigitte; Müller, Johannes (2012-06-25). Climate Change, Justice and Sustainability: Linking Climate and Development Policy (in อังกฤษ). Springer Science & Business Media. p. 206. ISBN 9789400745407. ↑ "DILG Region 3 - Regional Management". Department of the Interior and Local Government. สืบค้นเมื่อ May 29, 2016. ↑ "Highlights of the Philippine Population 2015 Census of Population (Region 3)". Philippine Statistics Authority. สืบค้นเมื่อ May 29, 2016. ↑ "Presidential Decree № 224". สืบค้นเมื่อ November 5, 2016. ↑ "Executive Order No. 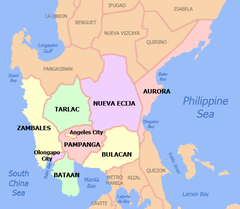 103; Dividing Region IV into Region IV-A and Region IV-B, Transferring the Province of Aurora to Region III and for Other Purposes". Philippine Statistics Authority. 17 May 2002. สืบค้นเมื่อ 29 March 2016. SECTION 4. The Province of Aurora is hereby transferred to and shall form part of Region III. ↑ "List of Regions". National Statistical Coordination Board. สืบค้นเมื่อ 9 January 2011. หน้านี้แก้ไขล่าสุดเมื่อวันที่ 27 ธันวาคม 2560 เวลา 07:42 น.